The students participating in this project took an old style of animation (check out a previous blog post here), and incorporated it into not just modern art but into a practical art demonstration of the secrets of motion. The animation technique I am referring to is an extension of the Zoetrope. The Zoetrope is a cylinder with long slits and sequence drawings on strips of paper that when spun appeared to be moving ( this was popular in the 19th Century in Europe & America). 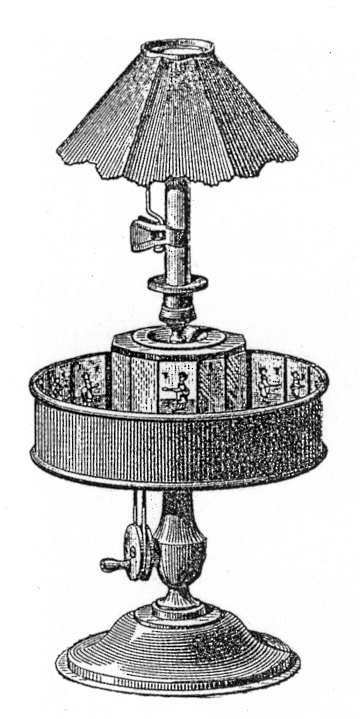 The Zoetrope inspired the Praxinoscope, which in turn inspired the Zoopraxiscope. The Zoopraxiscope was a projector device, designed by Eadward Muybridge, that used round discs with images printed around the disc rim that - when rotated - appeared to move.The design concept in The Bicycle Animation follows the same principle. By having the images (in this case laser-cut) rotate, the eye loses track of where to focus and the animation begins to blur into itself, but what happens with the rotation is that our eyes pick a point to focus on and as each piece if art hits that spot our eyes blur that to the one before, and the one before, tricking ourselves to believe the motion is still. The bicycle animation uses the speed of the bike to get the smooth motion. The faster the person riding on the bike goes, the smoother our eyes can blend the animation. The wheels of the bike can change speed and duration, which makes the art "live art" in that it can change and grow in real time. I found this art facinating and wonder why it does not exist as bike deco's on the market already. For all the silly ways to customize bikes (like stickers), this art is beautuful and functional. A good material, even hard plastic, would be enough to create the art. If this art was available for sale: I'd own two. If you would like to own a laser cut Bicycle Animation design please go to www.etsy.com/shop/katybeveridge1. These are not visible with the naked eye, it must be filmed to animate. This is a piece created to question whether it was possible to film animation in realtime. Part of my CSM 3rd year disseration project I was looking at proto animation (really early basic animation) in contemporary design. I've taken a lot of influence from other contemporary designers who are using these techniques to explore the way we look at animation and how its made. As stated on my channel I have interviewed animators such as Jim le Fevre and in my research referenced other people using this technique such as David Wilson and Tim Wheatley who did this before me. I developed this project based on what is being done in animation right now as well as a lot of primary research into the history of animation techniques. Big Thanks to my friend Stefan Neidermeyer who did the sound. The soundtrack is made up of various bike noies recorded during the filming process which Stef then remixed to make the amazing soundtrack. Thanks to Henry Chung (http://henrichung.wordpress.com/) Fernando Laposse (http://www.fernandolaposse.com) and Dominic Roup and their great bikes for making an appearance.